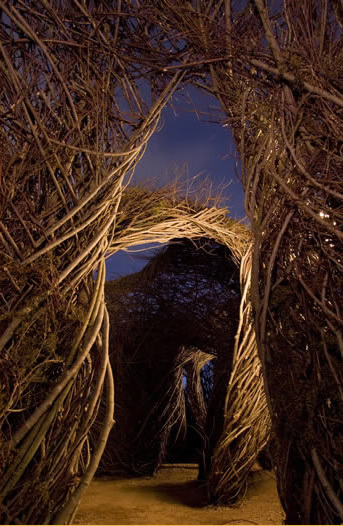 Patrick Dougherty often remarks that his trek toward art began in the pine woods around his childhood home in Southern Pines, North Carolina. I know it’s so because, as his sister, I was there. Patrick, the eldest of five and a born outdoorsman, led the rest of us on countless forest expeditions. Even back then he brought to his wanderings a love of nature and a knack for “dwelling in possibility”—an aptitude that would prove as useful for creating art as for exploring a forest—and his urge to build left a long trail of forts, tree houses, lean-tos, and hideouts. Later on he would build the mystery and freedom of the woods into these outsized, nestlike structures he is now known for. It took awhile, however, to realize that being an artist was an option—longer still to devise his unique form of sculpture. In college he earned a B.A. in English followed by an M.A. in hospital administration, then, this being the time of the Vietnam War, served for several years as administrator of an Air Force hospital in Germany. Returning to North Carolina afterward, he was determined to construct his life from scratch. As a start he purchased some wooded land outside Chapel Hill and began to hand build his extraordinary house. Small for a dream house—just one room—like the later works, it was large for a work of art, and despite its rustic simplicity, art was what it was. As in the sculptures to come, the materials were left undisguised, and the inner and outer surfaces exposed meticulous patterns of twigs, logs, saplings and stones. With the encouragement of friends, Patrick enrolled in art classes and, for a time, was enthralled with ceramics. But he longed to work much larger than clay allowed. Then one day walking home, there came what he jokingly refers to as his stick conversion: “I saw waves of saplings along my drive and thought ‘I could use these!’ Plentiful and renewable, they were just what I needed. But I first had to learn what birds and beavers and other natural shelter builders knew already: sticks have an inherent method of joining. Drag one through the woods to see what I mean; it entangles with everything.” The propensity of twigs and saplings to entangle and intertwine allows his sculpture to forego any outside means of attachment. Since that day almost twenty-five years ago, Patrick has created dozens of sapling sculptures at universities, museums, gardens and other settings around the world. The role of itinerant artist came naturally to him, and over time his process acquired a predictable pattern. During a preliminary site visit, he establishes parameters and finds local areas where cutting saplings is environmentally beneficial. He also acquaints himself with the history and personality of the site, elements that will be incorporated into the installation. With time and contemplation, an idea for the work arises—“a guiding feeling,” an impression amplified by rudimentary sketches, word associations, even an imaginary plot line. The actual construction of the work, including the time for gathering materials, usually takes about three weeks. Along the way he trains a team of volunteers as assistants. He continually bends and flexes the materials as he works, assessing their properties, sensing their potential. Our idea of the grace of a curve, he contends, comes from how far a bough can bend without breaking. Faced with the set of obstacles that each new project presents, he relishes turning limitations into opportunities. “I’ve discovered that if I approach a problem by being emotive and open, receptive to the hubbub and lulls, answers rise into consciousness.” Some problems are solved in a waking dream just before opening his eyes in the morning. And at times, in a tight spot, he finds himself saying: “Sticks, save me!”—a plea that hints at his close kinship with his materials. Conversations are welcomed, whether with cub scouts on a field trip or puzzled passersby—like the surrounding landscape, these get translated, says Patrick, into the installation. He likes people to see that creating art is a normal activity and that understanding it can be direct and immediate. “People seem to appreciate the familiar materials, the transparent process, the memory-laden fragrance of the wood. They tell me about a childhood climbing-tree, a backyard bird nest, the solace of hidden places.” A work lasts about a year before being carted off for compost. “Mine is an art of the ephemeral,” he states without regret. He sees individual works as phases of one long work-in-progress. What lasts and matters, he says, is the process itself, with its relationships and interchanges. The beating heart of Patrick’s work is at the magical overlap between nature’s creativity and our own. Like other web- and nest-making creatures, he appears to unwind forms from his own being, finding what he’s looking for as he creates it, leaving behind an unadorned architecture that is a picture of its making. Meanwhile, the saplings he interweaves radiate an energy all their own; their particular characteristics help propel the process and shape the installation, elevating nature from a building material to a full-fledged collaborator. In joining forces, art and nature seem to set each other free to try out new forms and activities. I think of Running in Circles (1996), an installation in Langeland, Denmark, where giant hoops of botanical energy roller-coastered across the trees; or of Paradise Gate (2001), on the Smith College campus, looking like a thicket that awakened to enchanted growth and creation; or Holy Rope (1992) dangling through an enormous tree on temple grounds in Japan, recalling the ropes shamans climbed in ancient times through sacred trees to heaven. When completed, the largeness of the structures tends to miniaturize visitors and magnify daydreams. The dim interior spaces feel like secret rooms inside nature. The swirling weave of the walls surges with life and movement, and light and sky give the openings the glint of cathedral glass or a high forest lattice. The modern illness perhaps most in need of nature’s cure is the detached utilitarian mindset whose effects now threaten nature’s (and thus our own) existence. The arts, in offering new ways of seeing and deepening imagination, help make nature’s cure contagious. Paul Klee remarked that at times in the forest he felt, not that he was looking at the trees, but that they were looking at him, even speaking with him—he was there listening. Those intelligent trees speak from Klee’s paintings, reconnecting us with depths from which the surface pressures of our lives constantly deflect us. Patrick’s work inspires by being radically participatory. With its natural materials and ancient methods, it evokes the mindscape of a time when nature was sacred, when humanity and the natural world were twins joined at the soul—the sort of “oneness” relived by a child perched in a tree house or roaming a forest. This age-old camaraderie is lived out in the building process: when sapling flexibility meets sculptural dexterity, it’s hard to tell where one starts and the other leaves off. Fellow workers and visitors enter into the process without the usual artist-viewer separations. The sculpture and its making are a tribute to twigs and saplings—their raw beauty and variability, their propensity to interlink into the most disparate structures, then give way to fertile decay—and a tribute by extension to all trees and forests, to the “wildness” in which Thoreau saw “the preservation of the world.” But the work is also a celebration of what Coleridge called “the reconciling power of the imagination”: as instinct once united us with nature, imagination reunites us with it. The finished structures—half art, half nature—are cocoons for the soul, places to dwell in possibility; whimsical, mysterious and oddly familiar. The intertwining becomes an emblem of harmony and interdependence, and trees begin to look like our own flesh and blood. “With his work, as with a glove, a man feels the universe,” writes the poet Tomas Tranströmer. Patrick would agree. “Sometimes,” he says, “when I’m working on a sapling sculpture, repeating the same motion over and over, I’m overtaken by a feeling of serenity and freedom. In those times, I have the longest view. I feel not only the pleasure of my childhood and its building phase, but I sense the presence of the forests of long ago and feel myself to be part of the largest conversation.” In drawing others into that vast conversation, his work perhaps expands the habitable possibilities. 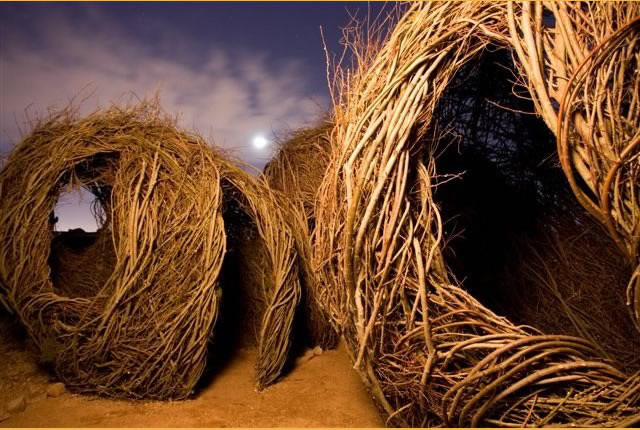 The above essay is the introduction to the volume Patrick Dougherty, published in 2008. It also appears in both French and English in Patrick Dougherty: Regard d’artiste, (Bernard Chauveau. Editeur Paris, 2011).Hide this content.